WordPress Toolkit is a single management interface that enables you to easily install, configure, and manage WordPress outside of WordPress itself. This can be very useful for example if you need to disable a problem plugin, theme or reset your WordPress password. You can also enable automatic updates to help keep your site secure. - Re-attaching WordPress after a backup restore or manual install. To install a new WordPress instance, click on the WordPress link in the left or right menu. If you have an existing site setup within your hosting account we recommend doing a backup prior to doing the WP install since your files may/will be overwritten and lost. If you want to install WP in a sub directory please choose custom install. Once you have WordPress installed and your site is active with our service you can login to manage your WordPress site. To do so, Click on the WordPress link on the left control panel menu and then the login link for your WordPress install. Note: You may want to add a new administrator so you can log directly into WordPress. To do so, first login using the above WordPress "Log in" link. In your WordPress Dashboard, go to: Users > Add New. Take note of the password generated by WordPress. Make sure to set the Role to Administrator. 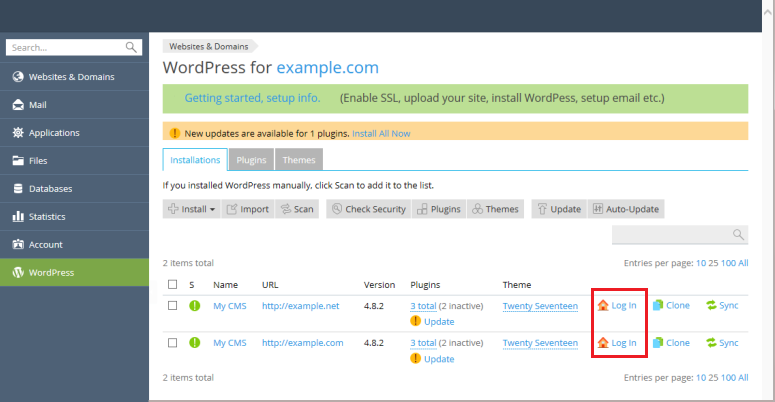 All WordPress installations added using the WordPress Toolkit or through the Applications page appear in the WordPress Toolkit automatically; those installed manually or restored from a backup need to be attached to the WordPress Toolkit. To attach WordPress installations to the WordPress Toolkit, go to the WordPress Link and click Scan.